This is where I post reviews of the books I've read. It's been two years since Polly moved to Mount Polbearne, and things are finally going well for her. She and Huckle along with Neil the puffin have moved into the old lighthouse, and she's managing the two bakeries and business is booming since Mrs. Manse retired. Then, everything seems to go horribly wrong. Tarnie's widow Selina returns to the island and befriends Polly, Polly really wants to be friends, but doesn't know how she can with the secret about her and Tarnie hanging over her head. Hucke's brother, Dubose, from America decides to visit, shirking his duties, which has repercussions for Huckle. Then, Mrs. Manse has a heart attack and dies, leaving nothing for Polly in her will. Mrs. Manse's sister Janet, sends her son Malcolm who pictures himself a businessman to manage both of the the bakeries. Malcolm can't tell the difference between Polly's hand-crafted artisan bread and the cheap fractory produced loaves and, he doesn't care. He's all about making a lot of money by having the bakeries run as cheaply as he can, by firing Polly. Huckle tells Polly about an idea of driving a van or food truck to sell her homemade bread to the locals and the tourists. While Huckle goes to America to deal with the repercussions of Dubose's visit, Polly finds a van and gets her new business running. 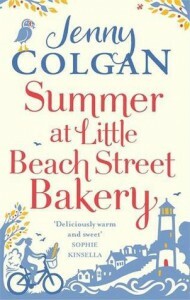 The bakeries aren't doing very well under Malcolm's mangement and he thinks Polly has turned people against him so he tries to bring down Polly's new business as payback. The characters are quirky, endearing, and some more lovable than others. The author gives us some subplots with unexpected twists and turns that all come together in a nice tidy way at the end of the story. The way the author used her descriptive writing you can picture the characters and the surroundings in your head as you read the story. I did find myself cheering Polly on in my head as she dealt with her problems. I did enjoy the epilogue because we discover that Neil is taking care of a nest with an egg inside it so he'll be a papa puffin soon and Huckle asks Polly a very important question.